After spending a couple weeks on the Croatian coast, we headed inland to the capital, Zagreb. The 2.5 hour drive was beautiful and peaceful. From Plitviče Lakes to Zagreb there is not much traffic until you approach the city. On the coast there are boats, seafood, islands and the water. The Plitviča Lake region is covered with forests, rivers, waterfalls and lakes. The road between Plitviča and Zagreb winds through hills, villages and forests. Beautiful scenery slowly gives way to urban landscape. Driving through the heart of Croatia to the capital city has an Eastern European feel. You will see large Communist era buildings mixed with old, beautiful roof lines and steeples of Orthodox churches and Catholic cathedrals. Zagreb's unique mix is sort of old and sort of new. If you ever want to splurge and experience a 5 star hotel, the Esplanade will exceed all expectations and is easy on the pocketbook! First and foremost, depending on when you stay, the cost is 3 or 4 times lower than similar hotels in NYC, SF or any Western European capital city. The hotel is centrally located and is within walking distance of the efficient and inexpensive trams as well as a few museums so we paid next to nothing for transportation. The "Espy" offers first-class service, luxurious furnishings and amazing food at affordable prices. And to top it off, the hotel has a grand old world feel. Since 1925, guests have frequented the landmark hotel which is filled with Art Deco along with modern decor. Guests include world leaders, politicians, film stars and musicians among it's distinguished visitors. Whether you walk the halls or enjoy a coffee on the terrace, you get the impression that this place has seen it's share of intrigue, East/West agreements and probably a few monumental political decisions. The hotel is a block away from the Botanical Gardens and a major tram hub. At the tram kiosk, you can purchase tickets and hop on/off as you like. 48 hours was not long enough to learn much about a city. However, we did our best and found Zagreb not only fascinating but also large by Croatian standards with close to 800,000 inhabitants. Rich offerings in culture, history, arts and music combine to this make a quality capital city – it's no surprise that the number of visitors increases each year. Zagreb is now a popular destination in its own right. Visitors glimpse intermingling European influences - architecture Eastern and Western along with Austro-Hungarian, Eastern Orthodox churches and Socialist structures combine to Zagreb being a one of a kind place. In 2012, an international survey conducted by Reader's Digest concluded that Zagreb the fourth most polite city in the world. According to the Zagreb city website, it was originally two hamlets on the hills of Gradec and Kaptol along with the settlements lying between the valleys of the former Medveščak Creek which is now Tkalčićeva Street. Today the Tkalčićeva Street is for pedestrians and bustling with cafes, shops and bars. Evenings on the Tkalčićeva are busy and lively. Zagreb is considered a museum Mecca. There are museums on art, museums of history, museums on archeology, museums on ethnic history and culture. With limited time, we chose 2 unusual museums - the Museum of Broken Relationships and the Nicola Tesla Technical Museum. The Museum of Broken Relationships is "where memories of broken hearts live." This global crowd-sourced project "is permanently located in the beautiful baroque Kulmer palace in the Upper Town which is a historical part of Zagreb." There are as many types of broken hearts as there are relationships. Loss of a mother when her child grows up. Loss when your best friend moves away. Loss when you leave for a few weeks on a business trip and return to find your lover with another woman. An axe, therapeutically used to destroy all the furniture of the unfaithful lover, is part of the installation to commemorate this loss. Loss when war comes to a country like Yugoslavia. Stories of young love formed and lost during the intensity of civil war. The stronger the love, the deeper the broken heart. Everyone who has suffered a broken heart (and who hasn't) will learn about the broken hearts of others and possibly indulge in a bit of schadenfreude. This museum offers a unique emotional journey through hundreds of break-ups. Plan on spending about 2 hours and then enjoy a coffee at the cafe. There is a confessional booth for you to add to this exhibit real time, if you are inclined. This confessional was constantly in use while we visited the museum. Nicola Tesla was one of the great inventors of the 19th century. Ironically or perhaps prophetically, Tesla was born in Croatia during a lightning storm in 1856. Tesla had a great mind and was the rival of Thomas Edison in discovering the science of electricity. Tesla is credited with inventing alternating current (AC) which is the foundation of our modern electrical grid. His inventions were licensed by Westinghouse which competed with Edison's General Electric (GE) company. In addition to inventing AC power generation and AC electric motors he also did research into wireless communication technology beginning the road to the wireless internet we enjoy today. He is often portrayed as sort of a mad scientist inventor because many of his experiments with electricity were very dramatic. He would literally sit in a room full of lightning reading a book. The Nicola Tesla Technical Museum is unique. This museum while similar to US technology and science museums also provides historical perspective from Communist Eastern Europe. Inspect the massive engines and the machines that helped to usher Eastern Europe into the Industrial Age. Walk around Yugoslavian armed forces submarines and warplanes. Take a selfie with the Soviet lunar rover! There is even a snow mobile that uses an airplane engine and propeller rather than a cat track for propulsion. The exhibits have a bit of a "Steam Punk" aesthetic that makes them beautifully functional. There are demonstrations of Tesla's original experiments with electricity and electrical motors. These are quite dramatic. There is also a curated collection of Nicola Tesla's original patents and work books. Tip - Open hours and experiment times vary. Be sure to check the schedule before you visit. When you are ready for a break from city life, walk over to the Zagreb Botanical Gardens is located in the city center. Wander the pathways and enjoy this research center which is also a public park. Enjoying the gardens is free. 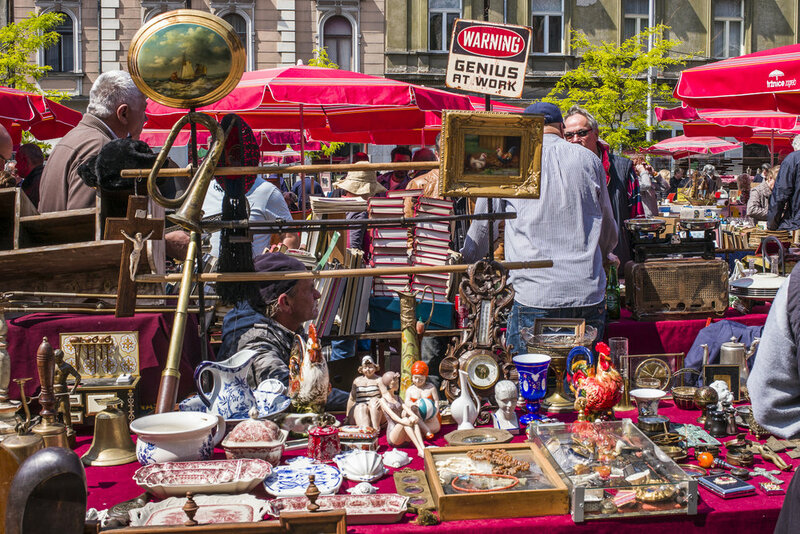 Zagreb's Markets are alive with bartering, bargaining and a fiery "let's make a deal Croatian style" ambiance. The "In the Belly of the City” food market claims to be the most famous market in Zagreb. "This central market is behind the main square, near the Cathedral just like in the 19th century. Since 1926 this square has been the city’s major area locals buy and sell local produce. Farmers (women usually known as “kumice”) from surrounding villages offer a variety of homegrown fruit and vegetables or homemade cheese and cream. Butchers and fishmongers work in the covered market downstairs." Close by, you will find the "Cvjetni Trg" or the English Flower Square. "You won’t find any fruit or vegetables there but it still has a few little stalls that sell flowers. Surrounded by old city buildings, it is a small oasis of what used to be a real farmer’s market." 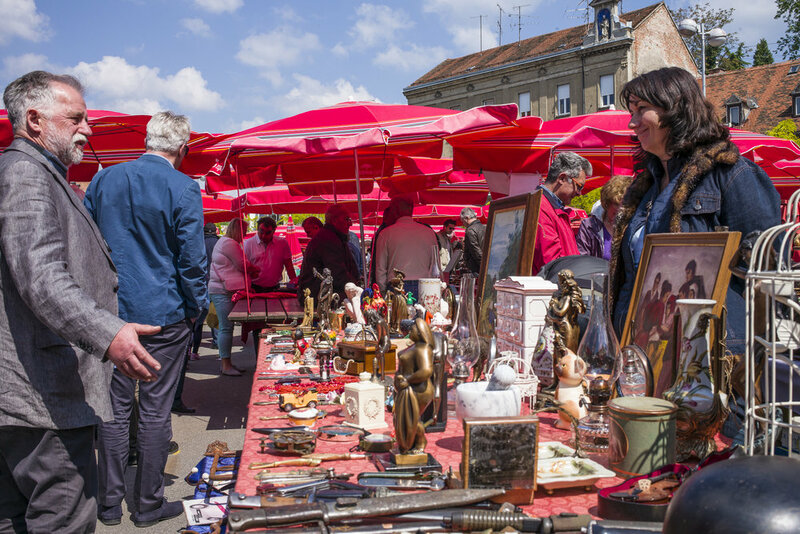 Some claim the Flea Market Hrelić – Jakuševac is the largest flea market or yard sale in Europe. 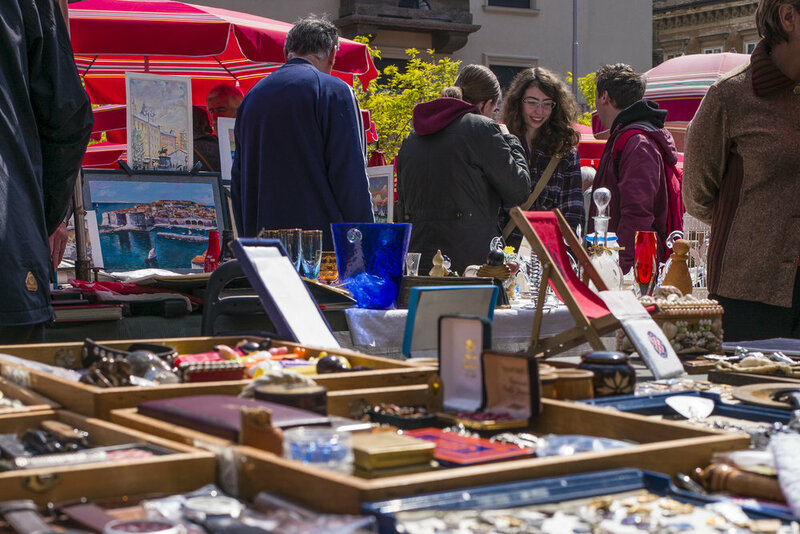 Local bargain hunters and tourists flock to the open air flea markets in and around the capital city. Some sell used cars in addition to all things automotive. A Westerner looking for a trendy keepsake will find memorabilia from the Yugoslavian Army, vintage posters and clothing as well as vinyl records and European prog-rock. Enjoy the colorful vendors who sell items you will likely find only in this part of the world. Tip - Wear your walking shoes because the market is huge. Also, bring plenty of Kuna! Our visit to Zagreb was short. Too short. It is impossible to truly experience a place in only 48 hours. Because this city has so much to offer we can't wait to return, perhaps in winter. We've heard the Zagreb Christmas market is one of the most beautiful in the world.